Federal health officials on Tuesday proposed sterner warning labels for acetaminophen, aspirin and ibuprofen, again cautioning millions of Americans who take the nonprescription pain relievers regularly of potentially serious side effects. The over-the-counter drugs remain safe and effective when used as directed, the Food and Drug Administration said. However, overdoses of acetaminophen can cause serious liver damage, even death, the FDA said. Although some 200 million Americans reach for a painkiller every day, about 700 of them each day end up in hospitals suffering from side effects — particularly from overdosing — including bleeding, liver and kidney ailments, CBS News correspondent Bob Orr reports. For aspirin, ibuprofen and other nonsteroidal anti-inflammatory drugs, there is a risk of gastrointestinal bleeding and kidney injury even when patients take the correct dose. The drug are linked to thousands of deaths a year. The FDA said the risk is rare when compared to the number of patients who take the drugs. The drugs are found in hundreds of products sold to treat pain, headache and fever. Health officials worry that the wide availability of those combination products allows patients to unwittingly overdose. The FDA has updated the labels on the drugs multiple times in the past to warn patients of their risks. In 2004, some of the warnings contained in the new proposal were included in pharmacy brochures and public service ads — a move that some critics said at the time didn't go far enough. The latest proposed changes largely would beef up and highlight those warnings on the labels of the drugs. They also would require the more prominent disclosure, using fluorescent or bold-faced type, the presence of the drugs among a medication's ingredients. The proposed rule would highlight the potential for liver damage for acetaminophen taken in high doses, CBS Radio News correspondent John Hartge reports. The labels also would warn of the risk of severe liver damage if patients take more than the recommended dose or consume three or more alcoholic drinks a day while on the drugs. The labels also would warn patients not to take multiple medicines that contain acetaminophen. In any given week, an estimated 48 million Americans take an acetaminophen product. For aspirin, ibuprofen, naproxen and other nonsteroidal anti-inflammatory drugs, or NSAIDs, their labels would have to contain additional warnings of the risk of stomach bleeding. The labels would note the risk is higher in patients older than 59, or in those who have stomach ulcers, take blood-thinning drugs or steroids, use other drugs that contain an NSAID or remain on the medications for an extended period. An estimated 17 million Americans take an NSAID daily. 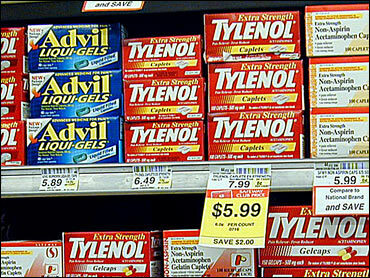 Acetaminophen is sold under the brand name Tylenol and in multiple generic versions. Acetaminophen sends an estimated 56,000 people to the emergency room each year, the FDA said. About 100 people die each year after unintentionally overdosing on the drug. Ibuprofen is sold under the brand names Advil and Motrin and in generic form as well. Naproxen is best known as Aleve, but is also sold generically. The NSAIDs are blamed for sending more than 200,000 Americans to the hospital every year, and are linked to an estimated 16,000 deaths, the FDA said. While all the affected drugs are available without a prescription, they also are used in multiple combination products that are sold only with a doctor's note. The proposal won't take effect until a year following its scheduled Dec. 26 publication in the Federal Register. However, the FDA said it strongly encourages companies to begin updating their labels before the rule becomes final. The agency posted the proposal Tuesday on its Web site.